In the introduction article “Shamanism and Ecstatic States” we went over the history of shamanic practices and the reason they appeared. Here I will go over the methods used in traditional practices to prepare you for trance induction. First, we have to understand how this brain functions normally before we apply the life hacks discovered by shamanic traditions. We all have two brains. The prefrontal cortex is responsible for our mental activity. That’s what we routinely call “the brain” – the part responsible for our cognitive functions: logic, calculating, planning and language. This brain has all the knowledge but when it comes to decision making, needs to get the safety approval from our self-preservation specialist – the limbic system. The limbic system is responsible for our emotions, sensations and feelings. The latest studies show that feelings provide the basis for human reason—brain-damaged patients left devoid of emotion struggle to make the most elementary decisions. During gestation, birth and early childhood, the limbic system registers all of our sensations and feelings, without translating them into the language of cortex, simply because it’s not developed yet. The prefrontal cortex develops until the age of 7 and it is fully developed only at the age of 25. All these sensations and feelings are forming what neurologists call a limbic imprint. If these sensations and feelings are loving and nurturing our imprint will translate into “I am safe here”. If these sensations and feelings are confronting or even aggressive our imprint will tell us that we need to guard ourselves to be safe, and that becomes our comfort zone. Guarding becomes the only state where we can feel safe. We all have different levels of fear imprinted in our limbic system – the question is how do we stop feeding the fear and cultivate our conscious intentions? In our daily life, the prefrontal brain works independently of the limbic brain. However, we have two moments in a day when we can communicate consciously with the limbic brain (the subconscious). When we wake up and when we go to sleep – this is when the frequency of our conscious brain is close to the frequency of our limbic system (theta waves). A shamanic ceremony has the purpose to bring us first to this state in between awake and asleep called trance or hypnotic state. To get there the ceremony invokes the same steps we go through when we go to sleep. We cannot fall asleep without feeling safe, so the first step in any shamanic ceremony is to create a safe space also called “sacred space” that will communicate to our limbic system that is OK to surrender to sleep. Words have no influence on the limbic system because it does not understand them. The only language it understands is sensations, feelings and emotions. Hypnotists invoke feelings of safety and comfort using verbal suggestions but you have to dig into your past experiences and bring those suggestions to life, otherwise it will not work. This is the reason nobody can hypnotize you without your collaboration. In the traditional ceremonies, this was done by invoking experiences in your life that bring you comfort. For example, the Native American ceremonies are using the directions to invoke all the comforting elements in nature and express gratitude for all its gifts. They start with East and the colour yellow – the direction of the sun rising, invoking the comfort of seeing after a dark night. Seeing is connected directly with safety – when you see around you, you are not afraid of being surprised by something hiding in the dark. South (white) – in the northern hemisphere is associated with the warm comforting sun in the midday. West (black) – the direction of the sun setting and clouds that bring the rain. Nothing can live without water, so the west is vital. North (red) – The direction of the cleansing winds that make the leaves to fall and start a new cycle of regeneration. It’s the symbol of endurance and letting go of things that do not serve us anymore. The spiritual path in the Lakota tradition is called the Red Road – symbolizing the resilience and adaptability necessary to evolve and grow as human beings. Father Sky (blue) – the Great Spirit – symbolized by the eagle. Mother Earth (green) – from whom we receive our support and nourishment. Because we have such a different life experience compared to the Native Americans, many of these elements used in a traditional ceremony, especially the ones related to the physical comforts will not be as effective. For the modern man living in a city, the light is not an exclusive attribute of the sun anymore. We are surrounded by artificial light and therefore our limbic system is not associating anymore the sun rising with the light being turned on. For example – people that lived their whole life in a city, where there is no such thing as a dark field when they go in the outback, they are frightened by the huge darkness surrounding them. For them, the artificial light is a comforting factor because it has been part of their life since they were born. Comforting warmth was again an attribute of the environment but nowadays it comes from artificial sources like radiators, stoves and central heating units. Water is also not necessarily linked to the rain – we still have city water during droughts. 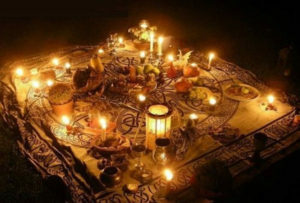 Understanding the fundamentals behind a shamanic ceremony allows you to come up with your own method, more suitable to calm your limbic system. In our ceremonies, we use elements from different shamanic traditions, adapted to the modern environment we live in. In the next chapter, I will present different psychosomatic methods used for trance induction and the five stages of trance.